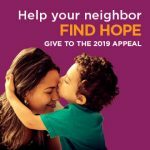 Following the second weekend of this year’s Catholic Charities 2019 Appeal on April 13-14 2019, our current totals at Sacred Heart of Jesus Diocesan Shrine and Parish are $26,884 or about 63.3% of our Parish Goal of $42,500 This amount was provided by 146 of about 672 potential donors or about 21.7%. Our thanks to all those who have so far responded to this year’s campaign so far! This years’ Diocesan Catholic Charities goal is again $11,000,000. The current Diocesan total stands at $6,585,649 or 59.87%. Every day, Catholic Charities services help protect, strengthen and empower the people of Western New York. The goodness we give to one can be multiplied and spread to many. Call 218-1400 or visit ccwny.org/ donation.